Deming is an Amtrak train station at 400 East Railroad Boulevard in Deming, New Mexico. The station consists of a shelter on a concrete pad. An old wood depot, built in 1881 between the Union Pacific and BNSF railroads, has been moved and repurposed. In March 1881, the second transcontinental railroad, uniting the Atchison, Topeka, and Santa Fe Railway from the east with the Southern Pacific Railway from the west, was completed at Deming. To mark the occasion, a silver spike was driven to connect the rails. 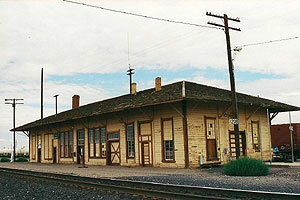 Deming subsequently received a large two-story "union depot" that in 1930 was remodeled into a one-story structure. The station is currently a flag stop, served only when passengers have tickets to and from the station. ^ "Amtrak Fact Sheet, FY2017, State of New Mexico" (PDF). Amtrak. November 2017. Retrieved 7 January 2018. ^ "Deming Station". Amtrak's Great American Stations. Retrieved 14 November 2014. This New Mexico train station-related article is a stub. You can help Wikipedia by expanding it. This page was last edited on 29 September 2018, at 04:58 (UTC).